The traditional samba school will again be competing in the Grupo Especial after coming top of Série A (Access Group) in Carnival 2017; this year they will be parading to the theme of ‘O que é, o que é?' (What is it, what is it?) a famous song by Brazilian composer Gonzaguinha. RIO DE JANEIRO, BRAZIL – On Sunday, March 3rd, samba school Império Serrano will once again open the first evening of Carnival parades from the Grupo Especial for Rio’s 2019 Carnival. Scheduled to begin at 9:15 PM, the group will present their ‘samba enredo’ (thematic samba composition) along the theme of the classic Brazilian song ‘O que é, o que é?’ by composer Gonzaguinha. The ‘rainha de bateria’ (queen of the drum) for Império Serrano this year will be Quitéria Chagas, who has previously held this role from 2006 to 2010, photo courtesy of Gabriel Nascimento/Riotur. The school was promoted from Série A (Access Group) in 2017 after their samba enredo “Meu Quintal É Maior do Que o Mundo” (My yard is bigger than the world), which paid tribute to Brazilian writer Manoel de Barros and the Pantanal region, finished top of the group. Before that, the group had languished outside of Grupo Especial for eight consecutive years. This year, the group are looking to further cement their place in the top-tier with a parade produced by Paulo Menezes, honoring the work of Brazilian composer Gonzaguinha, especially his 1982 album ‘Caminhos do Coração’ (Paths of the Heart), which also coincided with the last time that Império Serrano won the Grupo Especial. The school was almost demoted last year after ranking thirteenth place in Grupo Especial, but the ‘Conselho da Liga Independente das Escolas de Samba do Rio de Janeiro’ (Council of the Independent League of Samba Schools of Rio de Janeiro) or ‘Liesa,’ intervened, allowing fourteen samba schools to compete in this year’s parade. The school is well-known among Carnival aficionados for its animated ‘bateria’ (samba school band), dubbed ‘Sinfônica do Samba’ (Sinfonia of Samba), and its rich history, which has seen the school win the Grupo Especial nine times, and the Série A four times, including in 2017. 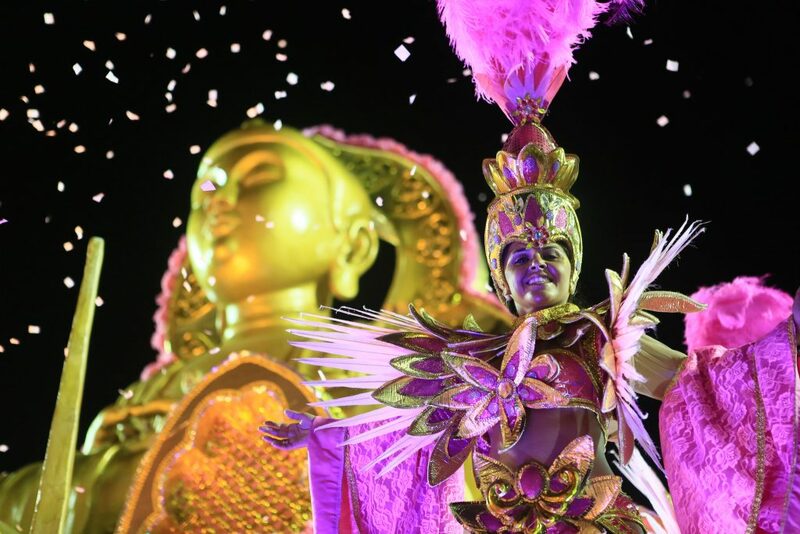 While following a Chinese theme last year, the school will also be using this year’s parade to pay tribute to one of the legends of Carnival, the first ever female Carnival composer and their former collaborator, Dona Ivone Lara, who died last April at the age of 96, photo courtesy of Raphael David/Riotur. Império Serrano was formed in 1947 after a falling-out with another samba school ‘Prazer de Serrinha,’ and is famous for being the first school to employ a female composer, Dona Ivone Lara, in 1965. They’ve also had other great composers such as Arlindo Cruz and Silas de Oliveira in their ranks. In 1982, the Brazilian singer Clara Nunes recorded the samba ‘Serrinha,’ for the school; and in 2004, despite financial troubles and internal disputes, the school received a standing ovation for its samba-enredo ‘Aquarela do Brasil’ (Brazilian Watercolor) considered by many to be one of the Carnival’s all-time best. While talking to O Globo, producer Paolo Menezes promises that this year the school will present a more modern, less baroque and less traditional parade, which will be different from what has come before while maintaining the characteristics of the school.